Lovely 18th-Century Mandolin Concertos in Vivaldian or post-Vivaldian style. 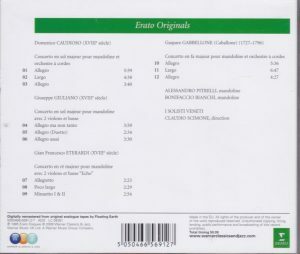 The CD is part of “Erato Originals”, an obscure but valuable series of reissues of Erato recordings out of the vaults by Warner Classics, from 2009. 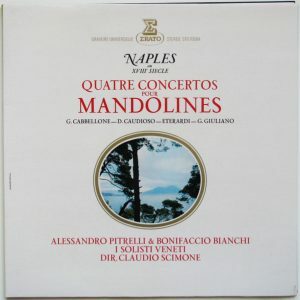 The reissues are somewhat cheap and slapdash – no liner notes, just a gatefold-opening laminated cover with track listing, and we’re not even told who, of mandolinists Alessandro Pitrelli and Bonifaccio Bianchi, plays which concerto – contrary to what the CD’s title implies, they are NOT concertos for two mandolinS, but concertos for (one) mandolin. That wouldn’t matter if it was, say, Vivaldi’s Mandolin Concertos, but in this case, liner notes and historical information would have been very useful. The composers are so obscure that only the dates of one of them are known – Gaspare Gabbellone, 1727-1796. The three others are only given as “18th century”. Well, I guess less is better than nothing, and liner notes or not, it’s good to have this recording back. Research shows that it was first published on LP in 1971 (the Warner reissue provides a misleading copyright date of 1985, and I don’t know what it refers to, maybe an earlier Japanese reissue), Erato STU 70684 (where the misleading “mandolinS” was already present), and there’s an entry on the invaluable discogs.com (link will open new tab to page) – lacking, alas, a photo of the liner notes, but giving the exact attribution of mandolinist to respective concerto: Bonifacio Bianchi in Caudioso and Eterardi, Alessandro Pitrelli in Giuliano and Gabellone. 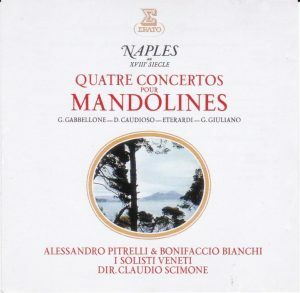 Incidentally, Bianchi and Pitrelli are the mandolinists playing in Scimone’s first recording of Vivaldi’s Mandolin Concertos, from 1969 (first CD reissue on the Bonsaï budget series, Erato ECD 55013, with many subsequent reissues, see my review) – his remake from 1983 was with Ugo Orlandi and Dorina Frati, first Western CD edition Erato ECD 88042. 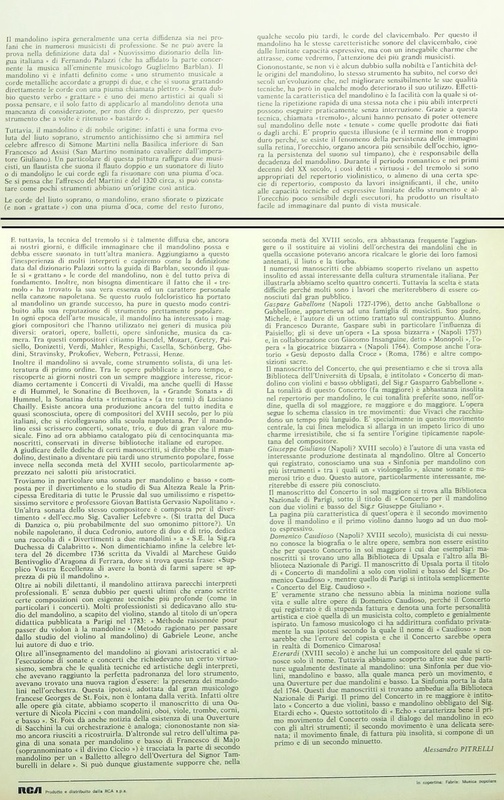 I did find on flickr a photo of the liner notes of an Italian edition of the Erato LP – in Italian of course, and they turn out to have been authored by mandolinist Alessandro Pitrelli. I’ve also uploaded the document for better convenience. 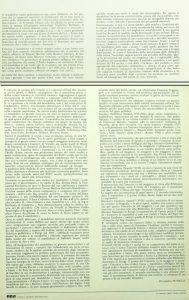 A summary of those liner notes appears on the back cover of an Electrola Germany LP edition, which is listed on discogs.com – for German-speaking audiences only. Pitrelli claims to have listed more than 150 works written in the 18th century for the instrument, concertos, sonatas, trio and duos, from composers whose biographies are often unknown, mostly Italians linked to the Neapoletan school, kept in various libraries of Italy and the rest of Europe. A choice of four, says Pitrelli, was difficult. Domenico Caudioso (his Neapolitan birthplace is given with a question mark) is known only through this concerto, whose two known manuscript are held in The Upsala Univerity Library and at the “Bibliothèque Nationale de Paris”. And sure enough, it is listed on the online catalog of Bibliothèque Nationale de France (where Caudioso is supposed born in Novara with question mark), with a dating “between 1760 and 1800”. The score is available in a modern edition on the International Music Score Library Project. Giuseppe Giuliano (aka Giuliani, and listed that way on the International Music Scores Library Project), also Naples question mark, also dates unknown, also manuscript said to be detained by the French Bibliothèque Nationale, although here what turns out from a search on BNF’s catalogue is a Sinfonia for two mandolins in F major, and a modern transcription for plucked orchestra of what seems to be the Concerto in G , but not the original manuscript. Well, at least Giuliano gets a (very scanty) entry on French Wikipedia. And if you thought it was impossible to lapse further into obscurity – sure it’s possible, and, when the recording was first released, Eterardi was even in search of a first name. Apparently, it’s been retrieved (there was a later LP release on Erato STE 70684, with a different cover, which already corrected things) and he’s now called Gian Francesco Eterardi. Other than this concerto, two other works of his are said to be known, both again for mandolin and both in Paris, a Sinfonie and an Overture. Here’s the BNF catalog listing for the Concerto, with a tentative date range of 1760-1770, but the entry makes no reference to the subtitle which Pitrelli attributes to the concerto, “Echo” – but the way Pitrelli quotes it, “Concerto for two violins, bass and mandolin obliggato by il Signor Eterardi echo”, it seems a tad cryptic, with that echo seeming to refer to the composer rather than the work (the subtitle is associated with the concerto in the modern transcription for plucked string orchestra, by the same transcriber as above, also listed by BNF). As far as biography goes, Gaspare Gabbellone (also spelled Caballone, Cabelone, Gabbelone or Gabaldone – great way to escape Interpol!) is the best-known among the four, with dates, birthplace (Naples) and even an entry on Wikipedia Italy, where you learn that he was a student of Francesco Durante, a Padre and a composer of operas and sacred works. Manuscript in Upsala, and uploaded on the International Music Scores Library Project (under the name Caballone), but in a manner that makes it frustratingly unusable. All these biographic minutiae aside, the four concertos are lovely specimens in a style that may be “Neaopolitan” but which I hear as “post-Vivaldian” – I’m not saying that these composers intentionally tried to imitate the music of Vivaldi, I even doubt that they knew his music, but the works sound very much in the style of Vivaldi’s own Mandolin Concertos, especially when the mandolin is pitted on the background of pizzicatti or staccato strings, reminiscent of Vivaldi’s own RV 425, which is a compositional process these composers seem to relish – in appears in all middle movements, tracks 2, 5, 8, 11 but also in the Finale of the Eterardi Concerto (track 9). That said, looking at the Caudioso score on IMSLP and trying to make something out of the Gabbellone manuscript uploaded by the Upsala University, part of that may be Scimone’s choice rather than the composer’s instruction (speaking of which, it’s interesting to note that in his 1983 remake of Vivaldi’s Concerto RV 425, Scimone applied the same principle. In his score, Vivaldi offers the option for the orchestra to play pizzicato, but only in the first movement, but Scimone extended the principle to all three movements. In 1969, he played even the first movement arco, and the difference is phenomenal: playing pizzicato turns a piece that is pretty, but ordinary, into one of Vivaldi’s most sublime inspirations). The middle movement of the Giuliano Concerto, track 5, is also written as an occasional dialogue between mandolin and solo violin, very pretty. The first movement of Eterardi’s Concerto is written less in “echo” than in imitation, with mandolin repeating the phrases tossed by strings (evokes the beginning of the Papageno-Papagena duet), but the effect is lovely nonetheless. There’s not much discographic comparison to this recording. Too bad Il Giardino Armonico didn’t pick these up. The interpretations sound typical Scimone / I Solisti Veneti: a bit too solemn, a bit too sentimental, with string tone just a tad thick, lacking a touch of energy and drive in the allegros – but the music’s charm comes through. Transfers are fine, except for a little sonic glitch track 11 at 3:07, were the sound is marred by about 20 seconds of (bad) vibration. TT 51 minutes.